Great to have some of the 3rd and 4th medical students from University of Limerick Graduate Entry Medical School visit us at Theatre 7, University Hospital Limerick. Their enthusiasm for the robotic surgery project is evident from the video below. Pictured are Michael F. Collins, MD and Chancellor of the University of Massachusetts Medical School & Senior Vice President for Health Sciences at the University of Massachusetts with Calvin Coffey the Foundation Chair of Surgery in University of Limerick and University Hospitals Limerick Group. NUI Galway will host the 42nd Sir Peter Freyer Memorial Lecture and Surgical Symposium, the largest Surgical Conference in Ireland, from 1-2 September. Michael F. Collins, MD is Chancellor of the University of Massachusetts Medical School & Senior Vice President for Health Sciences at the University of Massachusetts will deliver the Memorial Lecture entitled ‘In Search of the Tossed Cap: Following Medicine’s Privilege’ on Friday, 1 September. Dr Collins currently oversees the University of Massachusetts system-wide health and life sciences portfolio, charged with leading strategic initiatives to strengthen the university’s efforts in the area and to engage more fully with the Commonwealth’s dynamic health and life sciences sector. Dr Collins is actively engaged in service to the Commonwealth of Massachusetts and has amassed vast experience in governance of not for profit and educational entities. Currently, he serves on the boards of UMass Memorial Health Care, Massachusetts Biomedical Initiatives, The American University of Beirut, Commerce Bancshares Corp., Worcester Regional Chamber of Commerce, Greater Worcester Community Foundation and the Higher Education Consortium of Central Massachusetts. He is a Board Certified Physician in Internal Medicine and a Fellow of the American College of Physicians. Professor Calvin Coffey is the Foundation Chair of Surgery in University of Limerick and University Hospitals Limerick Group. Professor Coffey will deliver the State of the Art Lecture entitled ‘Da Vinci and Colorectal Surgery’ on Saturday, 2 September. Professor Coffey in 2016 pioneered robotic intestinal surgery in Ireland and led the team that set up the first multidisciplinary robotic program in Ireland. He is the chief author of the book Mesenteric Principles of Gastrointestinal Surgery: Basic and Applied Science. This book is the first reference test on the human mesentery, related diseases and surgical treatment strategies. He is editor in Chief of the journal, Mesentery and Peritoneum. The Programme also features a Session on the Role of Research in Surgical Training discussing the optimisation of the potential and opportunities for all Surgeons and trainees to take part in research, acquiring necessary skills and methodology throughout their careers. Professor Coffey has published ground-breaking research which has identified an emerging area of science having reclassified a part of the digestive system as an organ. Professor Coffey’s research proposes that the mesentery, which connects the intestine and the abdomen, is an organ. For hundreds of years it had been seen as a fragmented structure made up separate parts. Their lectures are the focal points of a large programme containing some of the best surgical research from this country”. UL HOSPITALS Group has announced the appointment of Mr Colin Peirce, MD, FRCSI, as Consultant Colorectal/General Surgeon. Mr Peirce graduated with first class honours in surgery from Trinity College Medical School, Dublin, in 2004 and previously worked in the UL Hospitals Group as a specialist registrar in general and colorectal surgery in 2012/13. Mr Peirce said he was “very excited and honoured to join the robotic surgery team in Limerick in what is both a unique opportunity and program within the Irish health service”. Commenting on the appointment this week, Colette Cowan, CEO, UL Hospitals Group said: “We are delighted to have been able to entice Mr Peirce home to join what we feel is one of the best, if not the best Department of Colorectal Surgery in the country. holds a variety of medical positions, both academically and professionally. These are the following; Foundation Chair of Surgery, Professor of Surgery, Graduate Entry Medical School in the University of Limerick. Consultant Surgeon in Health Services Executive (HSE). Deputy Director, 4i Centre for Interventions in Inflammation, Infection and Immunity. Vice-Dean of postgraduate surgical education in RCSI for the mid-western region. Secretary of the Irish Association of Coloproctology. Council member of the Irish Hospital Counsultant’s Association and lastly, a James IV Travelling Fellow since 2011.
eolas examines the robotic surgical services on offer to public patients and how surgery has been revolutionised by this technology. 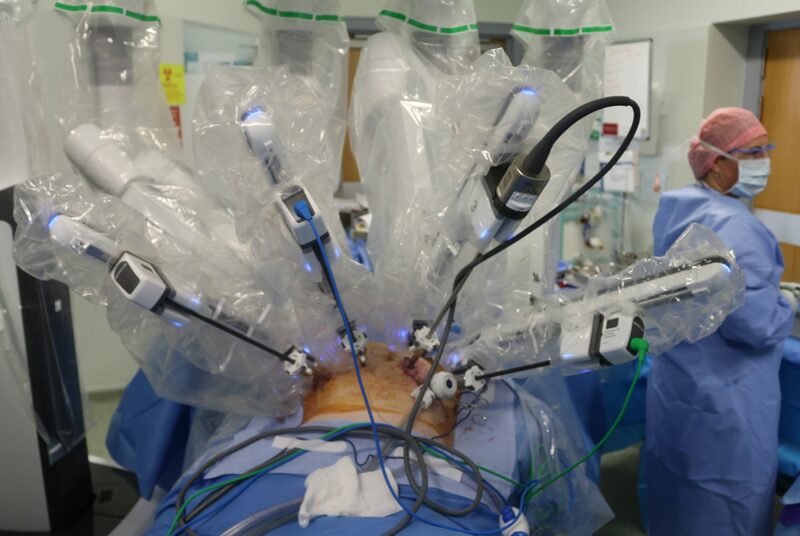 The Robotic Assisted Surgery (RAS) Program at University Limerick Hospital is at the forefront of future surgery delivery. The hospital now offers the robotic surgery to all patients in the Mid-Western region. The control, accuracy and versatility provided by the console controlled instruments is unmatched. It is the most advanced form of keyhole surgery and is of the highest standard currently available globally. During surgery, the Da Vinci robot is secured or ‘docked’ to the patient and has four working arms, each requiring only an 8mm skin incision, to which operating instruments are attached. Once docked, the surgeon who is positioned at a console nearby controls the robotic arms. The 3D view provided to the surgeon is unprecedented in surgery to date. The dual console allows two surgeons to operate simultaneously ensuring optimal decision-making and doubling the expertise. Until the RAS Program was launched in May 2016, this type of surgery was only available in private health institutions in Ireland or patients had to travel abroad. The program was funded by the Mid-Western Hospitals Development Trust and the University of Limerick. The Minimally Invasive Surgery (MIS) Forum has also been established to provide evidence of regulatory compliance. The team comprises of around 15 professionals with meetings focusing alternately on morbidity and mortality. The robotic team performed extensive research and training prior to introducing the program. This included surgeons who travelled to the United States and Australia to complete robotic training fellowships. Surgical approaches and techniques have changed dramatically over the last 25 years. Traditionally, patients with kidney or colorectal cancer would have needed a large open incision (20cm or more) to remove the affected organ. However, keyhole surgery revolutionised surgical practice. Robotic surgery has further enhanced keyhole surgery benefits by allowing a level of technical precision that is not possible in traditional surgery. Major surgery for kidney or colorectal cancer with use of robotics has a shortened recovery time of around four days. Patients lose a minimal amount of blood during surgery, need less pain medication post operation, are mobilising on the first postoperative day and have a reduced length of stay in hospital. This enhances patient flow through the hospital therefore benefiting all patients, who have had either robotic or traditional surgery, in the hospital due to the freeing up of occupied bed days. On average, three robotic operations take place each week in the hospital. Through the reduction in length of hospital stays and other savings such as instrumentation, the program runs at cost neutral. The dual console is the only one of its kind in Ireland and allows for training of future surgeons. The surgeons are positioned side-by-side and the control of the surgical instruments can be swapped between both surgeons. UHL can also broadcast live surgery within the hospital to its junior doctors. This provides an educational program for medical staff, nursing staff and students. The program so far has focused on the colorectal and urological fields. Gynaecological, endocrine and pelvic floor surgeons are undertaking robotic training and these specialities will lead to further utilisation of the robot and further opportunities for patients to benefit from the cutting edge of surgical technology.